Each semester, NC State’s undergraduate and graduate supply chain students collaborate with corporations to find real-world solutions through the completion of team-based practicum projects. After completing their assignments, each team gets the chance to compete for first-place honors and share their solutions with the local supply chain community, including professionals from some of the industry’s leading companies. Last semester’s teams worked on projects for corporations including American Red Cross, Advance Auto Parts, Duke Energy, Biogen, Siemens, Lenovo, and MetLife to find solutions on topics including cost savings and innovation, contract optimization, supplier performance evaluation, 3D printing, inventory stocking parameters, cost analytics, savings tracking tools, staffing resource models, risk assessment, market analysis, delivery optimization, inventory process development, and global procurement process analysis. 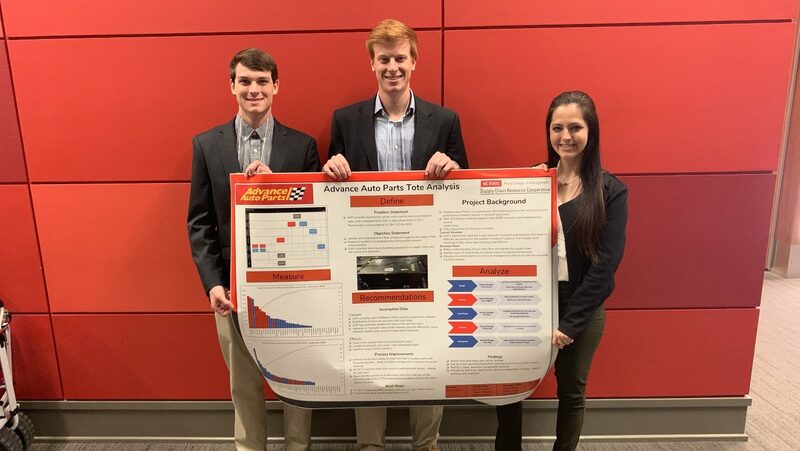 The student teams gathered in the ballroom at Talley Student Center last November to present their findings for judges evaluation and to share their work with faculty members, corporate professionals, parents, and peer students at the semi-annual Gallery Walk. I’m very appreciative of the SCRC for allowing me the opportunity to gain valuable skills by working with their partner companies. The collaborative field-based projects — which highlight the unique industry-university relationship of the school’s supply chain program — have been a core component of the supply chain student experience at the Poole College of Management since the inception of the Supply Chain Resource Cooperative (SCRC) 20 years ago. The 2019 spring semester Gallery walk will be held during the annual Leadership and Innovation Showcase on April 25th and is open to the public.